Hello Eyes On The Ring readers. Welcome to February 2015 as Ring Of Honor is on the road to Las Vegas and their upcoming 13th Anniversary show on March 1st live and only on Pay Per View. This week’s show had some interesting developments on the road to Vegas so let’s get down to business. We opened this week with the brand new Ring Of Honor Wrestling video intro (it’s about two weeks old, but still. It’s cool and it’s current). We go inside of the arena where Kevin Kelly and Steve Corino are at ringside to welcome us. We are also joined by Caprice Coleman in the booth. We then go to the ring and the first match of the night. Out first is Donovan Dijak who makes his way down to the ring accompanied by an exceptional pop from the crowd. Out next is his opponent for the evening in Ashley Sixx, which brings us to our first match of the evening. Result: Donovan Dijak defeats Ashley Sixx via pinfall after a Burning Hammer knee to the face to advance to the finals of the 2015 Top Prospect Tournament. Thoughts: The match started with both men feeling each other out in the early going. Things picked up when Dijak caught Sixx out of thin air with a back breaker on the outside of the ring. Dijak then threw Sixx back into the ring to get a near fall. Later on Dijack hit Sixx with a spinning big boot for another near fall (Hanson does something similar but Dijack does it better). Sixx comes back and mounts some offense of his own when he gets Dijak in a bent over position. He then goes to the top rope and delivers a senton landing on Dijak’s back which forces Dijack to fall to his stomach. From there, Sixx gets a near fall. The finish to the match came when Donovan Dijak picks up Ashley Sixx and delivers a Knee to the face from a burning hammer position and pins him for the 1-2-3 after the move. This match was very good both guys really showed me something and although Sixx didn’t win he will go places whether it’s in Ring Of Honor or somewhere else. Dijak impressed as well getting the pinfall victory and advancing to the finals of the tournament. Result: Will Ferrara defeats Beer City Bruiser via pinfall with a knee buster to advance to the finals of the 2015 Top Prospect Tournament. Thoughts: Ugh, This match was full of Beer City Bruiser doing a lot of things that he shouldn’t have been doing. On the other hand, this allowed a much smaller guy to do things to him that he shouldn’t have let happen. At one point in the match Bruiser dropped Ferrara face first onto one of the turnbuckles as Ferrara was standing on the middle rope. Ferrara recovers and tries to body slam the much bigger Bruiser but Bruiser falls on top of Ferrara for a near fall. From here, Beer City Bruiser clotheslines Ferrara over the top rope to the outside of the ring. Bruiser follows it up with a senton to the outside of the ring but misses. Ferrara hops up on the apron and hits a picture perfect tornado DDT to the outside. The finish of the match came when both men were back inside of the ring and Will Ferrara hits Beer City Bruiser with a knee buster to advance to the finals of the 2015 top prospect tournament. This match wasn’t as bad as Beer City Bruiser’s first round match but it wasn’t good by any stretch of the imagination. Now that Beer City Bruiser is out of the tournament hopefully ROH is smart and doesn’t bring him back because he doesn’t fit the mold of Ring Of Honor in my opinion. Back from commercial and reDRagon makes their way out to the ring with both the ROH World Tag Team Title’s and the IWGP Junior Heavyweight Tag Team Title’s in tow for a live edition of the Fish Tank. Their guests were their opponents at ROH’s 13th Anniversary show the Young Bucks. There wasn’t much to this. At one point Kyle O’Reilly referred to Bobby Fish as his “Life Partner” but then changed his mind and said Tag Team Partner. The Young Bucks came out and had some words with the champions. Matt and Nick both hit a bunch of super kicks (again over using the move per the usual) but this wasn’t too bad and it was a nice way to build to their upcoming match in Vegas. I can’t wait to see that match live as their match at last year’s War Of The Worlds was absolutely fantastic and hopefully this one can deliver like that one did. Commercial break. Back from commercial break and Tommaso Ciampa says that next week Jimmy Jacobs will find himself in the wrong place at the wrong time. Next week, Tommaso looks to gain some momentum towards Las Vegas and the Fatal Four Way match for the ROH World Title. QT Marshall makes his way to the ring and he gets on the microphone and says “There’s never been a star bigger than QT Marshall.” Is he serious? I’m not buying it, but we go to the next match. Roderick Strong gets on the microphone and says he wants BJ Whitmer so I’m assuming that this will be another match made for the 13th Anniversary show. We get a promo from Michael Bennett and Maria Kanellis where Michael Bennett calls ODB a man and seriously Michael Bennett is my new favorite wrestler with this comment…which brings us to our main event. Michael Bennett, Matt Taven, and Maria Kanellis vs. The Briscoes and ODB. Result: Michael Bennett, Matt Taven, and Maria Kanellis defeat The Briscoes and ODB when Bennett and Taven super kick ODB’s head off (which allows Maria to swoop in and pick up the pinfall victory). Thoughts: This match was crazy and a lot was going on. My apologies if this part of the review doesn’t make a whole lot of sense. To start things off, Jay Briscoe tags into the match and uppercuts the hell out of Michael Bennett’s face. Jay puts Bennett down with a super kick on the outside and then Mark comes off of the apron with an elbow drop. From here Adam Cole makes his way down to the ring with a sling on his left shoulder. He goes to the announcers table and says literally nothing. Meanwhile, back in the ring Matt Taven, hits a flying drop kick on Mark Briscoe and pulls a fallen Maria over for the pin, which only gets a 2 count. Mark recovers and takes Michael Bennett’s head off with a lariat out of the corner for another near fall. Mark tags in Jay and Michael tags in Matt and Jay delivers a swinging neck breaker for a two count. From there Michael Bennett spears Mark Briscoe off of the apron. Mark recovers after a little bit and Mark and Jay both get Michael and Matt up on their shoulders from there ODB tries to dive off of the top rope but Maria breaks it up and doesn’t allow it to happen. The finish came when Bennett and Taven deliver a duel super kick to ODB’s face, which allows for Maria to pick up the pinfall victory. Maria celebrates with Taven and Bennett as the show goes off of the air for the week. That will do it for me and this review of Ring Of Honor wrestling television. This was an overall good show with really three matches on it but there was a lot of progression towards March 1st and the 13th anniversary show, which is great to see. The only match I had a problem with was the second match between Beer City Bruiser and Will Ferrara. I hope that now that Beer City Bruiser has been eliminated from the tournament that ROH realizes that he isn’t very good and gets rid of him. I would definitely recommend watching Donovan Dijak vs. Ashley Sixx as well as the main event. But, the rest was pretty much filler. Until next week readers I am Nathan saying so long for now and be sure to keep your Eyes On The Ring for all of the great content that we promise to provide with you in the present and future. Be sure to follow Eyes On The Ring on twitter @EyesOnTheRing as well as myself @Headliner5. 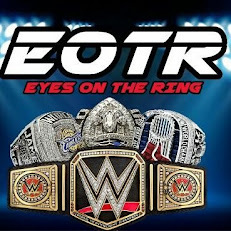 Last but certainly not least be sure to check out EyesOnTheRing.blogspot.com your hope for all things wrestling. Also don’t forget to tune into our weekly radio show each and every Sunday night over at blogtalkradio.com/EyesOnTheRing at 11:00pm Eastern Time. Last but not least be sure and like us on facebook at Facebook.com/EyesOnTheRing tell them Nathan sent ya.